Expand the links below to find out about a host of resources for students in our department. Please take some time to learn about our baccalaureate degree options and the special opportunities available to our students. Learn more about the baccalaureate degrees! Our department offers several Biology degree options. Click on the links below for details about each one. The Biology Honors program provides an opportunity for outstanding Biology majors to gain research experience with individual faculty guidance. The designation "Honors" will be added to the academic record of any student who completes the program. Learn more about the Honors program! The Biology Advisement Center offers information and guidance on a wide variety of subjects related to success in the Biology major. Talking to one of the Biology advisors can help you in a variety of ways. Advisors can help you to choose an emphasis within the Biology majors and design a plan to graduate. They can also shed light on various career paths and post-bachelors programs. You are required to see an advisor at certain points in your academic career. Dr. Richardson specializes in pre-health coursework and has years of experience - not only from her own medical school journey - but also from the experiences of the countless students she has advised. She is well-versed in all pre-health disciplines, including nursing, pharmacology, PT, OT, PA, Dental, and MD. She also advises on adding biology classes to other majors to qualify for post-graduate programs, as well as all 7 of the possible biology degrees, including general biology. If you cannot reach Dr. Richardson by phone (above) and/or the office is closed, the Biology Department Office (818-677-3356) will be able to tell you when Dr. Richardson will return to campus. Dr. Dole specializes in General Biology advisement. He is available only by appointment on Mondays from 10am-4pm. If a disability prevents you from accessing our online appointment system, please contact our office by phone at (818) 677-2675 for assistance. Your Degree Progress Report (DPR) lists your remaining graduation requirements. You can use the DPR/Planner to plan future classes and determine your graduation date. Our departmental advisors can discuss with you several career options for after graduation (and more convenient academic pathways to get there), including Medicine, Pharmacy, Dentistry, Optometry, Podiatry, Veterinary medicine, Graduate Nursing or Physician Assistant programs. Here's a link to a great video that discusses many points related to professional careers, and how you can prepare for one as a Biology major. Students interested in a career in Clinical Laboratory Science (CLS) should major in the Medical Technology track of the B.S. in Biology. The Medical Technology track prepares students for the clinical year of training and the California License exam in Clinical Laboratory Science or for training and certification in Public Health Microbiology. It is designed to meet the State academic requirements for Clinical Lab Science. Students who complete the course sequence for Medical Technology will be prepared to apply for the clinical year of training in Clinical Lab Science or to begin a career in industry or government. Follow this link for more information on California Clinical Lab Science Training Programs. Students should contact Dr. Sean Murray or Dr. Terri Richardson and study the catalog requirements for the Medical Technology B.S. option. Students interested in Teaching can begin by learning more about becoming a teacher. Admission to a CSU credential program or University intern program requires demonstration of subject matter competence in biological sciences, and there are several ways of completing that requirement. The most common is passage of a set of state-administered California Subject Examinations for Teachers (CSET), with six testing dates per year (http://www.ctcexams.nesinc.com/). The Department offers tutoring in Biology courses to students on the first floor of Magnolia Hall, CR5329, on a "drop in" basis. Fall 2018 schedule (coming soon!). How to remove a registration "hold"
This semester-long program provides an intensive undergraduate exposure to marine biology, and is designed for students with a serious commitment to environmental and marine science. The program is based at the Wrigley Marine Science Center (WMSC), situated on Santa Catalina Island, 26 miles from Los Angeles, CA. Read more about Catalina Semester! The Tropical Biology Semester is a package of concurrent coursework totaling 16 units, appropriate for upper-division undergraduate or graduate credit. The purpose of the courses is to expose students to the biology of the Neotropics by visiting the major ecosystems/plant communities of Ecuador. Read more about Tropical Biology Semester! Our inter-institutional training program provides an opportunity for engaged, interested, and successful trainees, both Graduate and Undergraduate, to gain the necessary skills and qualifications to springboard into careers in stem cell research. 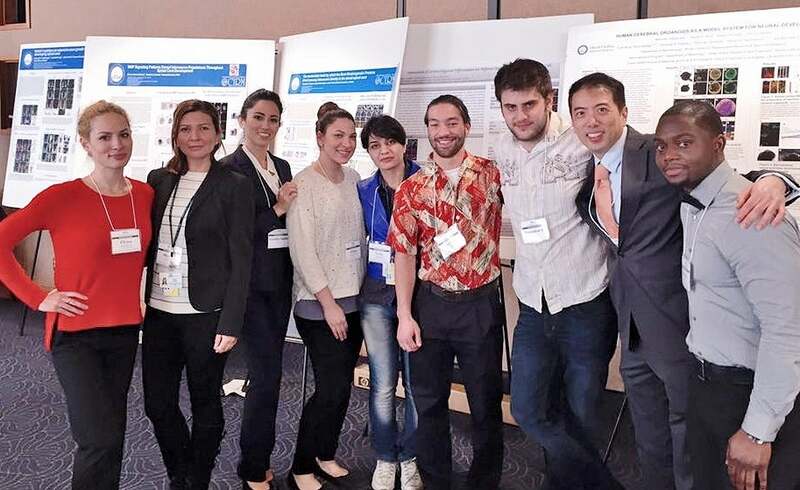 This program is expected to contribute significantly to the number of students prepared for research careers in stem cell biology and regenerative medicine that span the spectrum, from basic studies to translational approaches. Read more about the Bridges Program! There are more than 20 scholarships and awards available to Biology students. Learn more about scholarships and awards. Many CSUN faculty have on-going research programs year around, for students have a deep interest and have completed a sufficient amount of introductory coursework. Look at our faculty research specialties, and don't be afraid to visit and talk with professors about their research interests. Talk to one of the Biology advisors to navigate your Biology major and design a plan to graduate. Non-major needing transfer credit for Biology? Cornell University is accepting applications to its LSAMP Research Experience for Undergraduates (REU) program. LSAMP-REU is a paid summer research opportunity that provides undergraduate students with an opportunity to work with distinguished faculty and staff as well as network with others in their field of interest through weekly luncheons. Participants will gain theoretical knowledge and practical training in academic research and scientific experimentation. The LSAMP-REU was developed to aid in the retention of traditionally underrepresented minority groups in the sciences, technology, engineering and mathematics (STEM), and it offers a $4,000 research stipend, round-trip travel costs (up to $3,000), a room in residence, parking and access to state-of-the-art laboratories, libraries, computer/study lounges, etc. Application Deadline: 15 FEBRUARY 2019. For more information visit the LSAMP-REU website, and Apply Here to this summer research opportunity.